From worm-like skeins of pure silk, paper-maker Kath Russon weaves her magic, she teases and works the fibre into a 'sheet' of silk paper. On a visit to her workshops this was what inspired me to look at her silk paper not so much as a piece of paper, but as an integral part of a finished piece. Hanging up to dry, the sheets reminded me of a myriad of butterfly chrysalises, swaying gently in the air, shimmering as they caught the light. Kath unpegged one and handed it to me to inspect at closer quarters. Holding it up against the light of a window its internal structure could now be easily seen and the filaments interwove in a rhythm that reminded me of seaweed, wafted by ocean currents. In my mind's eye I could see fish darting between the lush growths of a Kelp forest. And that is how this simple study began.Rather than plunge straight in however, I tested my thoughts out on a spare piece. The application of paint revealed the paper to be extremely absorbent. Should it be painted on as it was, or should it be sealed with a layer of acrylic medium? Wishing to exploit the inherent qualities and structure of the paper, particularly the shimmer and glow of the silk as it caught the light, I chose not to seal it. As they say I chose to 'go with the flow', for it is only by experimenting that new and possibly exciting techniques are developed. How Was I To Reveal The Internal Structure? Since I was not going to be able to display the finished piece against the light to reveal the internal structure, another way of tackling this had to be resolved. The simplest solution was to place the paper over a dark background. To create something unusual, I stretched a piece of watercolour paper and treated it as shown in the Artstrips. To work with the silk paper, rather than against it, I opted to use inks for my 'painting'. Inks being a stain rather than a pigment are swiftly absorbed into any surface and once in the fibres are difficult to remove. Since this would occur anyway, even with watercolours, on such an absorbent surface it was a marvellous opportunity to exploit the pure vibrancy of ink colours. In such an exercise as this the work has to be executed swiftly and intuitively and I adopted a technique that borrowed heavily from the calligraphic quality of Oriental scroll painting. 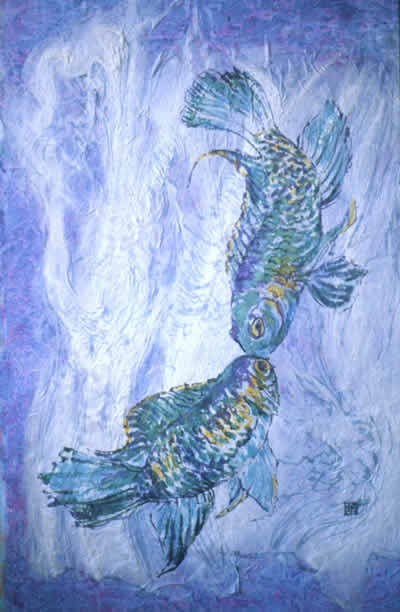 Reference for my subject matter was chosen carefully from a book on aquarium fish that contained a marvellous rhythmic silhouette of two fish, which echoed the rhythm in the silk paper. The composition was gently sketched in with a 2B pencil. Keep the pencil outline as simple and as gentle as possible. The surface is soft, so overworking or excess pressure can easily cause damage. A 2mm lead (ordinary pencil thickness) was excellent as the thinner leads (0.5mm : 0.7mm etc.) tended to catch or tear at the paper fibres. Once the pencil is applied it is inadvisable to attempt to rub it off this fragile surface. So keep pencil marks light and to the minimum. When wet these brushes 'droop' so it is better to hold them vertically. Keep the painting flat and take up a relaxed position. The brush can be steadied by 'skating' the tip of the small finger along the painting surface. A variation of pressure on the brush easily changes line thickness achieving a wonderfully descriptive line. A 'coloured grey' was mixed to match the base and used for the initial 'blocking in' of the design. Unmixed ink colours were then applied in a bold brushy fashion using the natural shape of the brush shoulder. A watered down version was drawn sparingly across the background ensuring the natural qualities of the silk were not overwhelmed. Neutral Grey detail completed the final accents ~ again applied sparingly.